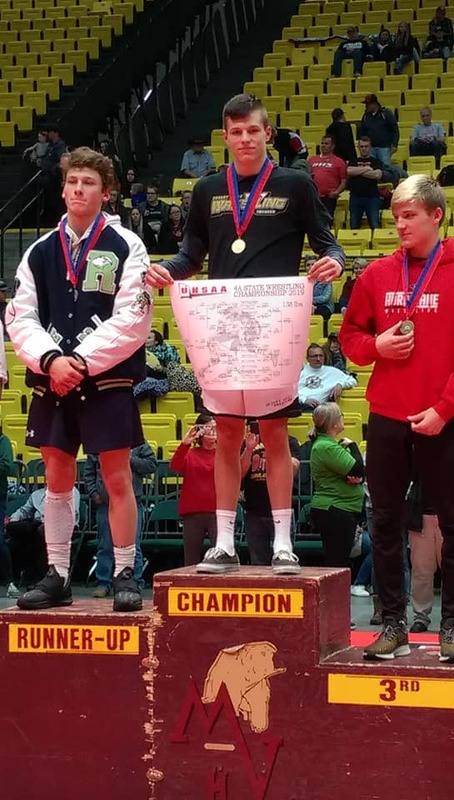 CEDAR CITY — Region 9 athletes made strong showings at the state 4A wrestling tournament held Friday and Saturday at Utah Valley University in Orem. Canyon View High was Region 9’s top team at state, scoring 143 total points to finish in fourth place overall for the second straight year. Payson won the 4A championship, with Uintah placing second and Bear River taking third. For Canyon View head coach Dallas Lowry, the tournament represented a special milestone as he watched his son Brady, a senior, finish his high school career on top by winning the state title at 152 pounds. Lowry said it was a very emotional moment for him to watch his son pin Cedar senior Michael Anker in the championship match. Lowry said he believes his late wife, who died in a car accident nearly seven years ago when their son was 11, was also watching the match from above and cheering her son on. Brady went out and won that match; he has rarely lost in the seven years since then. 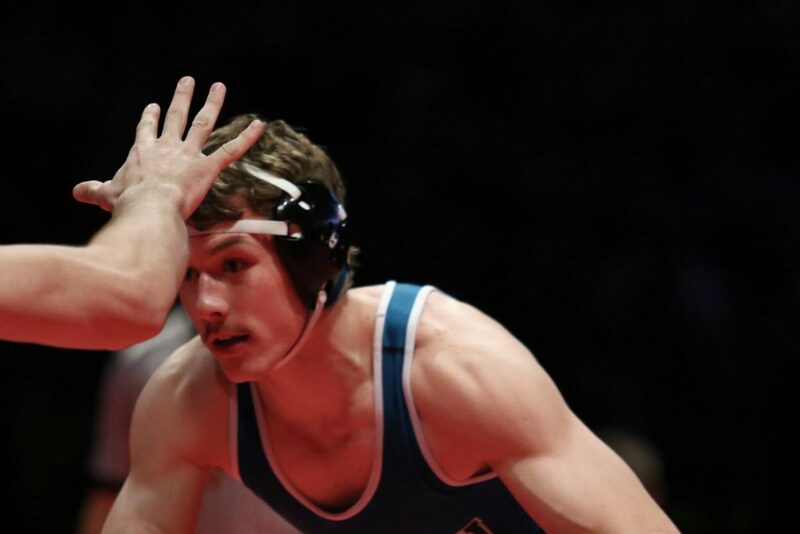 Saturday’s win was Brady Lowry’s second individual state championship, having also won the state title at 132 pounds as a sophomore, after which he took runner-up in state at 145 pounds as a junior last year. 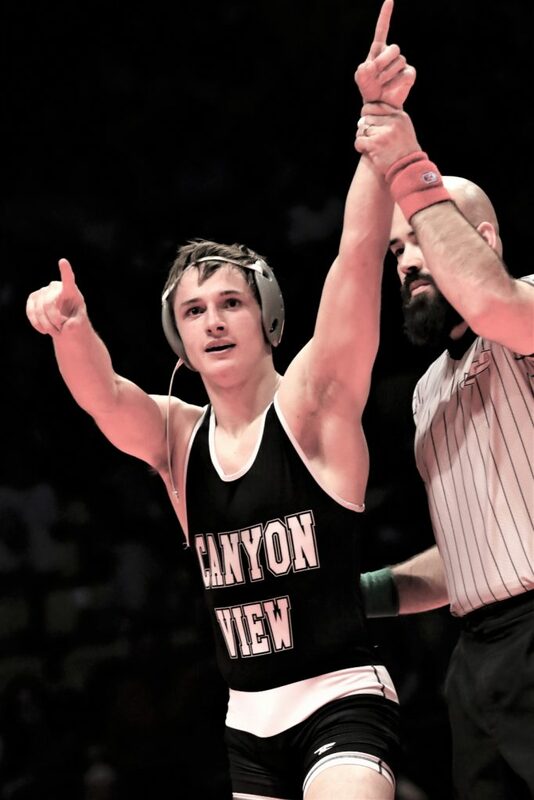 Canyon View also had five other medalists at state, including senior Braydon Cavalieri, who battled Payson’s Tyson Carter to a virtual deadlock in the 170-pound championship match, which lasted three full rounds. 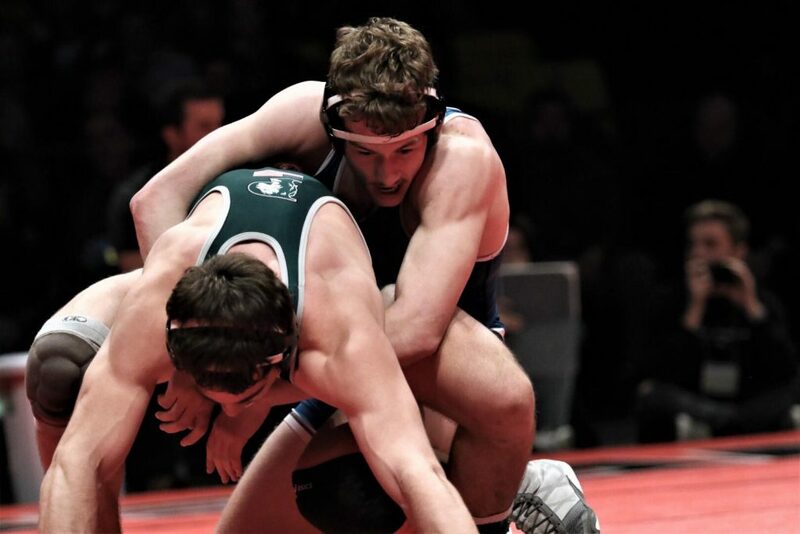 Lowry said Cavalieri fell shy of the state title by just two seconds, as Carter gained one point near the end of the third round to break a tie and take a 7-6 lead. Cavalieri then nearly achieved a takedown, only to fall short as time ran out, Lowry said. Lowry had high praise for Cavalieri, who is one of three straight-A students on the Falcons’ squad, the other two being Chris Ball and McCray Webster. Also finishing second in state for the Falcons was junior Gavin Carter, who made it to the finals of the 182-pound bracket, despite being a No. 5 seed. Gavin Carter beat three higher-seeded opponents in succession, all by pin, only to lose by decision in the finals to Salem Hills senior Merrell Morley, the No. 1 seed from the other half of the bracket. 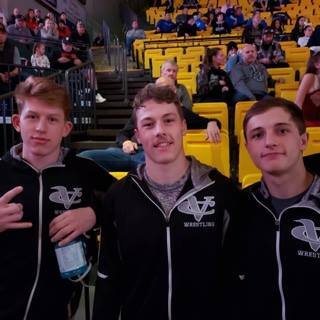 Canyon View also had three other medalists among the group of 13 wrestlers that qualified for state, namely junior Cole Lake, who took sixth at 132 pounds; senior Ryan Ball, who placed fourth at 160 pounds; and senior Riley Robertson, who took fourth at 285 pounds. See full listing of all Region 9 state finalists below, courtesy of trackwrestling.com. Hurricane, which finished seventh overall out of 27 4A teams at the tournament, had six state medalists, including senior Caleb Armstrong, who finished second in the highly competitive 132-pound category. Armstrong was the defending state champion at that weight but was beaten this year by Uintah senior Gavin Ayotte in the finals by a 4-2 decision. 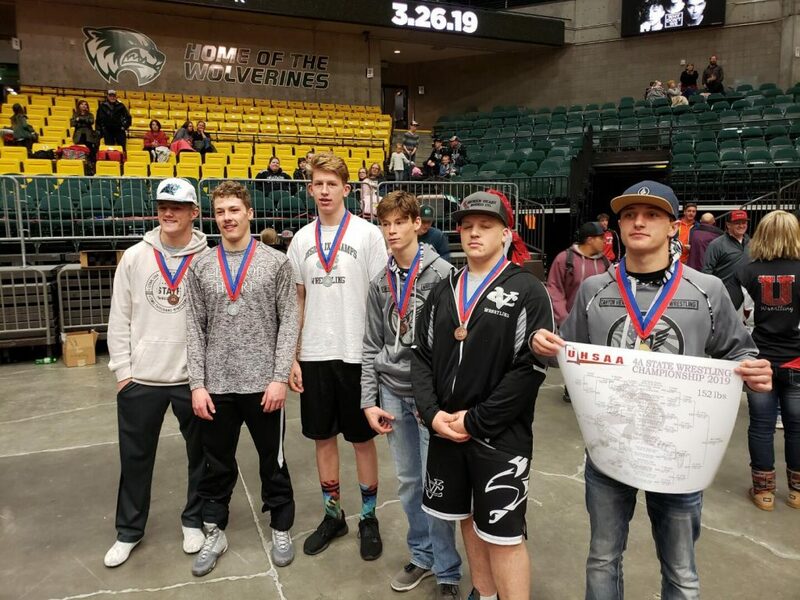 Cedar, which placed ninth overall as a team in the tournament, placed four state medalists, led by senior Nathan Ellis, who capped off a 37-3 season by defeating Payson senior McCoy Cook by a 6-2 decision in the 220-pound championship match. 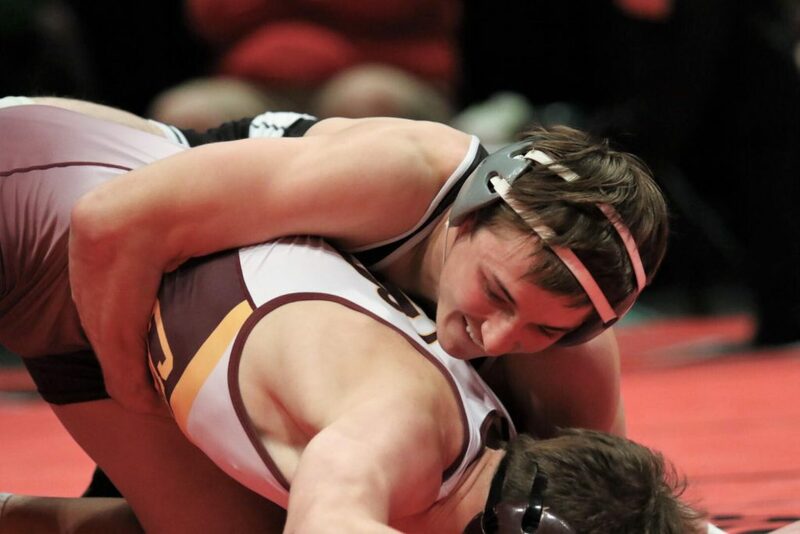 Also making it to the finals for Cedar was Anker, a senior, who lost to Brady Lowry at 152 pounds. 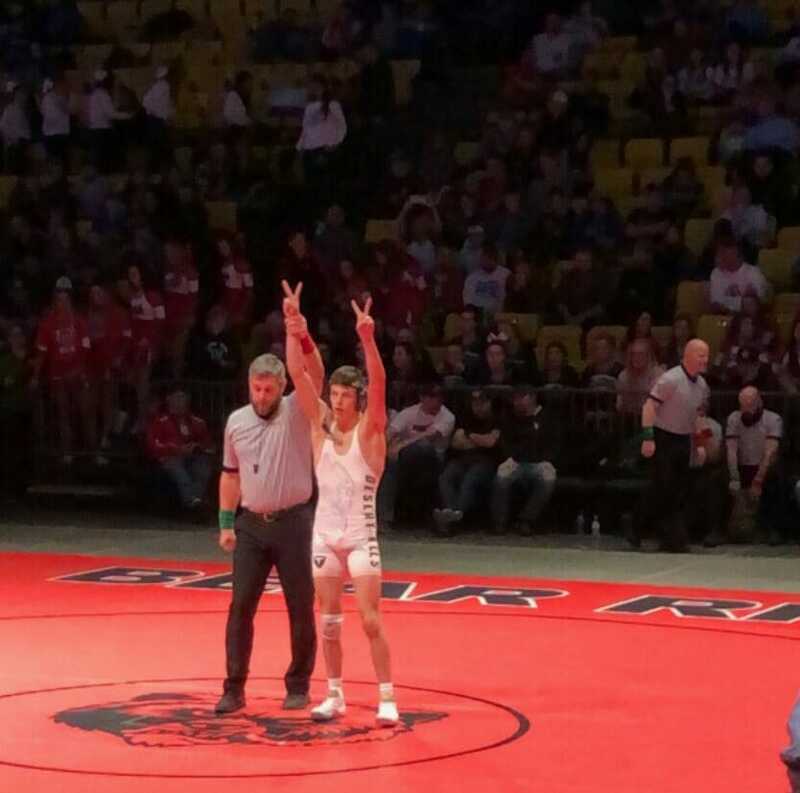 Desert Hills junior Ryker Boyce also won an individual state title, beating Ridgeline senior Chance Parker by a 9-5 decision in the finals match of the 138-pound weight category. 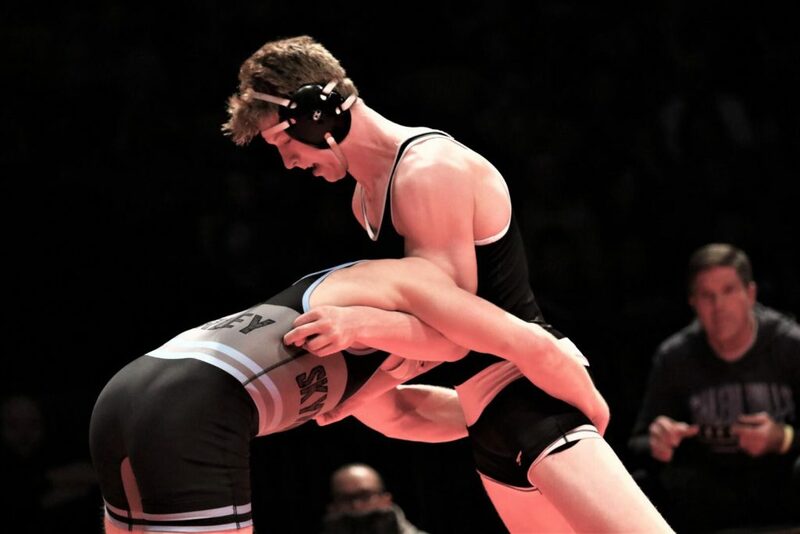 “I won state my freshman year at 106 pounds, and I worked very hard this year to get my second state title after an upsetting sophomore year,” said Boyce, who finished his season with a 41-5 record. Besides Boyce, Desert Hills had three other state medalists and finished eighth as a team. Also from Region 9, Snow Canyon had two state medalists and Dixie had one. See list below for results of each medal match involving Region 9 athletes. 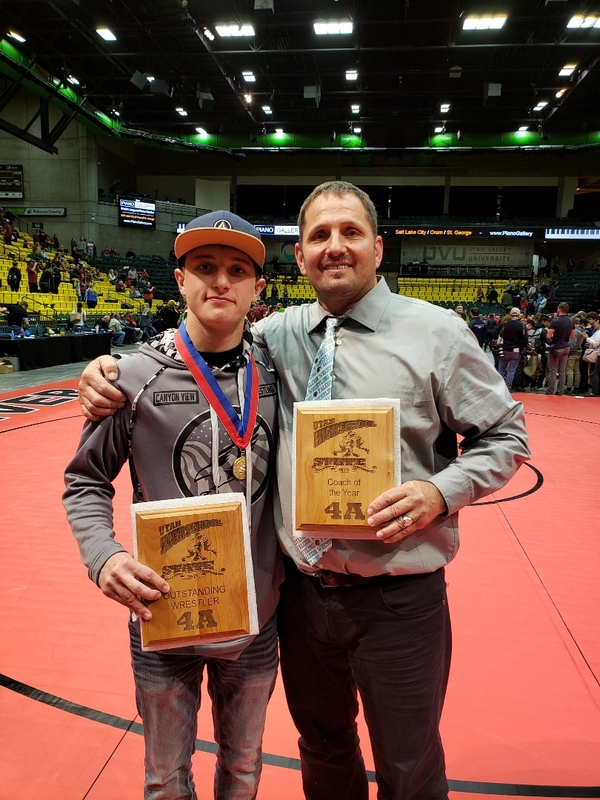 Dallas Lowry said the youth wrestling program in Iron County has been instrumental in building more competitive high school teams over the past several years, not just at Canyon View but at Cedar and Parowan high schools as well. Registrations for wrestlers from preschool age through eighth grade for the upcoming season are Tuesday and Wednesday at the CVHS wrestling room. For more information, call Dallas Lowry at 435-531-1606. 3rd place Raiden Harrison (Uintah) 32-10, freshman, over 4th place Austyn Ennis (Cedar) 40-7, freshman (fall, 2:51). 5th place River Smith (Bear River) 29-14, freshman, over 6th place Isaac Blair (Hurricane) 30-12, junior (fall, 3:37). 3rd place Layne Shepherd (Spanish Fork) 47-8, sophomore, over 4th place Jared Armstrong (Hurricane) 45-12, senior (fall, 5:59). 5th place Tristyn Dennett (Hurricane) 32-19, freshman, over 6th place Jordan Hammond (Stansbury) 32-18, sophomore (decision, 5-3). 1st place Gavin Ayotte (Uintah) 41-2, senior, over 2nd place Caleb Armstrong (Hurricane) 53-5, senior (decision, 4-2). 5th place Devin Robins (Orem) 33-10, senior, over 6th place Cole Lake (Canyon View) 46-18, junior (major decision, 11-1). 1st place Ryker Boyce (Desert Hills) 41-5, junior, over 2nd place Chance Parker (Ridgeline) 52-9, senior (decision, 9-5). 3rd place Joshua Armstrong (Hurricane) 51-7, sophomore, over 4th place August Harrison (Uintah) 37-10, junior (decision, 2-1). 3rd place Brock Loveless (Payson) 39-12, senior, over 4th place Clayton Warr (Hurricane) 46-9, junior (major decision, 12-2). 5th place Seth Burr (Mountain View) 43-12, senior, over 6th place Quade Jones (Desert Hills) 38-17, junior (decision, 3-2). 1st place Brady Lowry (Canyon View) 58-1, senior, over 2nd place Michael Anker (Cedar) 39-10, senior (fall, 1:31). 5th place Matt Brooks (Dixie) 43-9, senior, over 6th place Payton Jones (Green Canyon) 24-20, senior (fall, 1:53). 3rd place Terrell Buttars (Sky View) 44-14, senior, over 4th place Ryan Ball (Canyon View) 52-6, senior (decision, 2-1). 1st place Tyson Carter (Payson) 44-4, senior, over 2nd place Braydon Cavalieri (Canyon View) 51-6, senior (decision, 7-6). 1st place Merrell Morley (Salem Hills) 53-5, senior, over 2nd place Gavin Carter (Canyon View) 36-9, junior, (major decision, 13-5). 3rd place Gage Hall (Desert Hills) 31-6, junior, over 4th place Cade Hatch (Uintah) 30-15, senior (fall, 1:05). 5th place Carson Hansen (Snow Canyon) 40-18, sophomore, over 6th place Radi Stafford (Mountain View) 22-10, sophomore (injury, 2:23). 5th place Payton Murray (Cedar) 18-9, sophomore, over 6th place Elijah Stafford (Mountain View) 8-7, sophomore (fall, 3:51). 1st place Nathan Ellis (Cedar) 37-3, senior, over 2nd place McCoy Cook (Payson) 41-9, senior (decision, 6-2). 3rd place Hunter Larsen (Sky View) 51-5, junior, over 4th place Tuiits Kanosh (Snow Canyon) 35-10, senior (decision, 3-1). 3rd place Enoka Fuailetolo (Desert Hills) 34-10, senior, over 4th place Riley Robertson (Canyon View) 41-17, senior (decision, 5-4). 5th place Kioni Alvarez (Cedar) 40-11, senior, over 6th place Logan Fraser (Bear River) 39-21, junior (decision, 3-2).